After seven years of dedicated service, Wendy Hinz is retiring from Wisconsin AHEC. During her time at South Central AHEC, Wendy worked as a Health Careers Consultant. Wendy earner her Bachelor’s degree in Family Consumer Education from the University of Wisconsin – Stout and also received five vocational education certifications. She went on to receive her MS at the University of Wisconsin – Madison in Curriculum & Instruction, Health Education. Wendy taught at River Falls High School for two years and then went on to work at Middleton High School teaching Family Consumer Education for 37 years. She also developed the Health Science Occupations Education Department and served as the HOSA Advisor. “I consider myself a life-long learner,” said Wendy. “I loved working for the WI AHEC organization. In the last seven years I have learned so much about the world of non-profit, and in addressing the increasing need for health care workers. I have been truly blessed to have worked with all of the amazing individuals who mentored me from the very beginning. You will all hold a special place in my heart. Traci, Shayna, Chris I could not have asked for better co-workers and friends”. South Central AHEC Executive Director, Traci Lindsey said, ” It has been a privilege working with Wendy over the past seven years. She came to AHEC with extensive experience and a rich knowledge of health careers programming. Wendy was instrumental in creating our Health Careers program within the South Central region”. Traci went on to say, “Over the past several years, South Central’s Health Careers program provided presentations to over 4,000 students annually within our 13 county region. Wendy assisted with the development of the AHEC Statewide Health Careers Curriculum. Wendy also assisted numerous school districts with the development of Health Science programming in her tenure with AHEC. Wendy developed, along with our UW Global Health Institute partners, the High School Global Health Day held annually at UW- Madison. Wendy spearheaded the development of the annual AHEC Health Science Educators Academy in partnership with North Central AHEC. Wendy also served on the Health Literacy committee on behalf of South Central AHEC that provided health literacy training to students within our region. These are a few highlights of Wendy’s accomplishments with South Central AHEC. We were very fortunate to have her join our team. 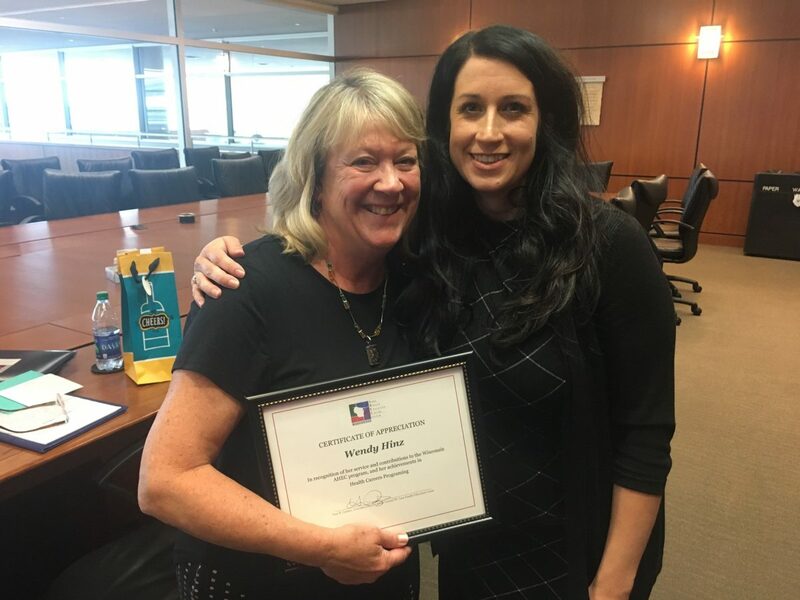 We are so appreciative of all Wendy has contributed not only to the South Central region but for her contributions to Statewide AHEC programming”.